How Do You Know You Trust Someone? This is a central question I believe everyone who works with our firm should ask. You share important information about your finances, dreams, and life with us. You aren’t going to do that unless you have a high level of trust in us. I spend a lot of time thinking about this and working with our staff to learn about how trust is built and how to audit our actions to make sure we’re acting in a trustworthy manner. Several years ago I ran across a book called The Trusted Advisor. The genius in this book is the authors developed a formula for you to easily check whether you’re being trustworthy. Adding the first three together on a scale of one to ten with one being low and ten being high divided by self interest on a scale of one to ten will tell you how you’re doing. Most of the time you’ll be able to do an analysis on how you’re doing with other people.well you build trust. To me competence means how good am I at a particular thing I’m trying to do with another person. I can have high competence and tell a client that I’m not an expert. I can be competent when I help my client find the right person to do a particular activity. I can be competent when I use expertise I’ve developed in a particular area. Competence isn’t always about doing it yourself, it’s about helping your client get an elegant outcome. Intimacy isn’t about being physically close with someone. It’s about how much you care about them as a person. How do you demonstrate that you care about the person you’re working with? How do you show that you care about those who are close to you? If I show you that I care about you and what’s important for you, it’s easier for you to trust me. Being authentic here is important. If you’re not authentic others will know. You can’t fake your way to intimacy, it has to be real. Where does reliability fit in? I think this is the easiest part of the trust equation to score high on. It’s also an area that many people fall down. To be reliable you only have to do a few things. You have to show up on time. You have to answer communications with others on a timely basis. You have to deliver product when you say you’re going to deliver product. If you’re going to be late, let the other person know you’re going to be late. They might not love it, but at least they’ll appreciate you letting them know. Self interest is one of the hardest to manage. If you’re in a business relationship with someone managing self interest is tough. Every time you talk about fees your self interest goes up. Every time you talk with a client about what you need, your self interest goes up. Both are important things to do. It’s the reason I like project fees versus hourly fees. I set the fee once and we don’t have to talk about it again. With hourly fees clients are always wondering what something will cost and trust will be lowered when this question exists. The second part of managing self interest is to make sure you’re mindful of what the other person’s self interest is. If you can find a way of controlling your own interest and make sure the other person is getting their interest taken care of trust increases. This is not always easy to do and it pays big dividends when concentrate on your partners self-interest. I always look at how my actions are building trust. I also look at how your actions build trust with me. When I find that I’m having problems with a client it’s usually one of the four areas of trust that’s out of whack. Most of the time I'll often find reliability falls away. Emails don’t get answered and phone calls aren’t returned in a reasonable time frame. My job is to talk those issues so we can set expectations. A good relationship only works when trust goes both ways. Some people think love makes the world go ‘round. I think that trust makes the world work. When we have high trust life is easy. 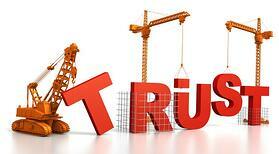 When trust slips working or associating with others gets hard. I work today to only associate those I can trust. Otherwise it’s just too hard. Hiring the right person is all about building trust. We have a case study on how to hire for unique abilities. You’ll learn a hiring technique I’ve used for over thirty years that has helped me hire well. To get this report, click on the button below.